Allianz Philippines announced during a press briefing that it will support the pursuit of five young Aetas until they make it to the Philippines’ obstacle course race national team training pool. It was a tough race for the five Aeta youths—Gellyann B. Soria, 17, Ivy O. Pelayo, 16, Danilo B. Yugyug, 19, Miracle D. Lansang, 21, and Jacob D. King, 22—of Villa Maria Integrated School (VMIS) in Porac, Pampanga as they competed for the and Female categories in the recent Allianz OCR Sunday held at Filinvest, Alabang last Mach 31. Yugyug finished without penalty in the top 15 of the race composed of 20 obstacles. A participant needs to land in the top 5 to secure a slot in the national team. According to Atty. 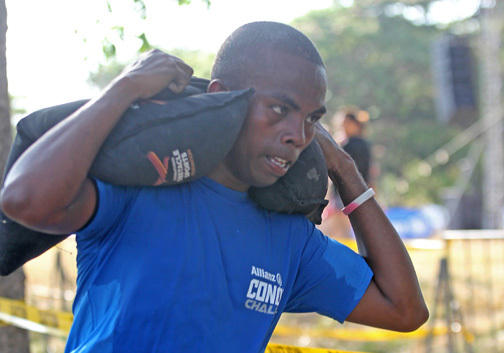 Al Agra, POSF president, Allianz OCR Sunday was the first of a series of four National Team Qualifier events supervised by the Pilipinas Obstacle Sports Federation and organized by Conquer Challenge. The POSF is recognized by the Philippine Olympic Committee, Philippine Sports Commission and World OCR (Obstacle Course Racing). Earlier, Agra announced the training of the national team in the USA Olympic Training Center in Colorado in time for the SEA Games, where OCR is expected to have a debut as a medal sport or as an exhibition game.